Great central Cape Coral location, this beautiful vacation rental is located on a gulf access canal, within walking minutes to the nearest grocery store, vaulted ceilings, open Florida living floor plan, 3 bedrooms, 2 bathrooms featuring 1 King and 2 Queen size beds, plus office, upgraded kitchen cabinets featuring all necessary utensils, theater seating in the living room, featuring a very modern white leather sofa (*note, sofa is different than the one pictured on website, new photos to follow), large flat panel TV in living room, total of 3 televisions in the house, west facing swimming pool which is electrically heated, large sun deck for lounging and quality time outdoors, boat lift with captains walk available to renters. 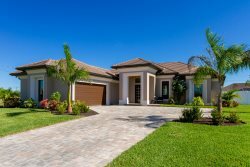 Villa Luke liegt sehr zentral in Cape Coral, wenige Minuten zum naechsten Supermarkt, kann auch zu Fuss erreicht werden, ruhige Nachbarschaft, West Lage mit elektrisch beheiztem Swimming Pool, grossem Bootsanleger mit Bootsdock, das Haus hat sehr hohe Decken und bietet sehr viel natuerliches Licht, 3 Schlafzimmer, 2 Baeder, plus Buero, grosse Kueche mit voll ausgestattet, sehr bequeme Leder Couch (*Sofa ist erneuert und nicht auf den momentanen Bildern, neue Bilder folgen) im Wohnzimmer mit grossem Flachbildschirm TV, Villa Luke steht fuer Sie bereit. The house was fantastic, our girls loved the (heated!!) pool and so did we ;-) Villa Luke is spacious, super quiet and just a great vacation retreat. Vesteva was also fantastic, the instructions were spot on amd the communication very proactive and friendly. Villa Luke was very clean. Bottom line: We can ony echo the positive feedback from previous guests amd hope to return! Everything was perfect! Thanks so much!! This villa is located right next to the lovely canal system with a boat mooring and direct access to the Gulf. The villa is clean, quiet and secluded with a lovely large pool and garage for parking. There is easy access to the local Publix supermarket down the road and a selection of good restaurants within 5 mins drive . The beautiful Sanibel island and Fort Myers are only 15 min drive away. The welcome visit was very useful and helpful and we had no problems with the villa during our stay. beautiful home! we loved the pool. Iwas very nervous having two children under four in a house with a pool. the doors are very heavy going outside so the kids could not open them by themselves. we loved fishing out back and how close it was to the beach. location is very secluded. we would love to visit again!! thanks for letting us stay! Home is gorgeous and we loved the pool. so nice to spend lazy afternoons hanging out my the canal out back fishing. Luke Gulf is clean, quiet, and the home has all the essentials most families might need. The pool is screened so the water stays cool, but spend a few minutes laying on the boat dock and you'll be warm enough for the water to be perfect! The photos show theater-style seating but the owners have updated the couch with a large, modern leather sectional. The decor is tasteful throughout the house and we were comfortable hanging out both inside, and in the large outdoor living area. Extra linens were included in all rooms and there were a ton of towels to go around - both bath and beach towels. While there for 5 days we only needed to buy a small pack of laundry detergent, toilet paper and paper towels. The home is a short drive or walk to Publix (grocery store) where you can get anything you need. The town is quiet but that's what you're there for, right? Shopping malls, boat rentals, the beach, Times Square, movie theaters, restaurants, bakeries - all within a 5-20 minute drive. This was a couples retreat and it was amazing. The home was a bit more than we expected and was very nice. My wife and I would recommend this home to others. From the check in to check out it was a great .The home was very clean and had all amenities needed during our stay. Stephen the host was great and responded within minutes. Hope you enjoy your stay as we did. Good luck. Thank you so much for hosting us. We had one of the best vacations ever. Definitely would stay again and suggest this rental to everyone. Great hospitality! This was one of the best vacations we ever had. Definitely would recommend this to other family's. Great hospitality!! Amazing communication, availability, and the property is exactly what the ad described. Would definitely rent from them again. Thanks for helping us when we really needed it. Our family is immensely grateful for working with us on such short notice, and for being available right after the hurricane. THANK YOU!!! It was a pleasure to work with the staff. They were helpful and prompt in helping me with any questions I had. It was a joy to stay here. It was relaxing, quiet, a beautiful pool to enjoy and great fishing in the canal. I can't wait to return. Thank you for a wonderful and enjoyable experience. The communication was excellent as well. Thank you. Home was better than pictured. Very clean, spacious and comfortable. My family of six were very comfortable during our 4 night stay. Pool was great and town is close by. Highly recommended. We were extremely happy with the home, cleanliness and overall condition of the home. Every team member that I had contact with was more than helpful. I was contacted about a mistake I had made when completing my reservation and was told that a correction had been made and that it was in my favor money wise. That was such a nice way to start my vacation. The property my family stayed in was exactly as pictured. The furnishings where nice, neat, and clean. The towels, and linens where all clean and appeared to be new. The house had enough basic starter things such as trash bags, dishwasher tablets and things such as that, you didn't have to run to the store right away except to buy food. The pool area was nice and neat, and well maintained with plenty of furniture for everyone to spread out and relax. Everything about our experience with Vesteva and with the Luke property was more than enjoyable. I have already recommended a friend. Very impressed with everything. The property has a very nice and open floor plan. It feels very private since the lot on the side as well as across the canal are vacant and wooded. We loved that the home has a pool table and ping pong table. We felt the home was even better in person than in the pictures.